This title should perhaps read "earliest" hard plastic by Madame Alexander. In 1947, Alexander switched over most of their production to hard plastic. The first introduction of plastic on such a scale must have been a nerve-wracking experience for the company to make this commitment. Not only was the public accustomed to the look of composition dolls that dominated the doll market since the 1930s, but hard plastic also had a few hiccups to resolve in its early use for dolls and toys. Although nothing as daunting as the problems that came with composition production, Madame Alexander worked with Dupont to iron out some plastic formula issues. 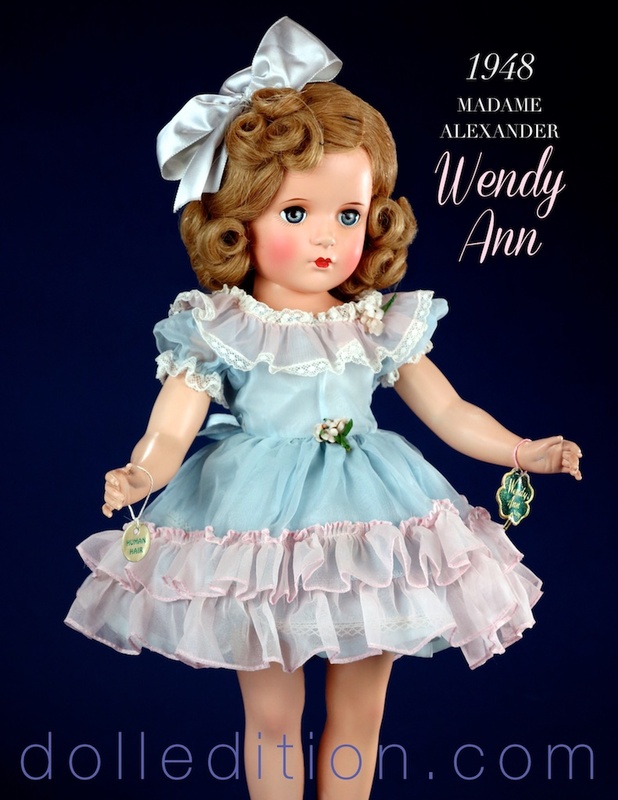 The Wendy Ann made of composition was also one of the Madame Alexander dolls that made the 1947 and 1948 transition into hard plastic. The costuming for this Wendy Ann is charming, with baby blue and pale pink rayon georgette elaborately trimmed with lace, and a blue satin bow for her hair creates the party dress effect of this beautiful doll. Wendy Ann is wearing black Mary Jane shoes of the period. One of her two hang tags announces "human hair" for her wig. The other tag is a cloverleaf Wendy Ann hang tag. 1948 Wendy Ann 18" early hard plastic doll by the Madame Alexander Doll Company. Dolls available in different sizes were a big feature of the time. This Wendy Ann came in 15," 18," and 21" sizes. 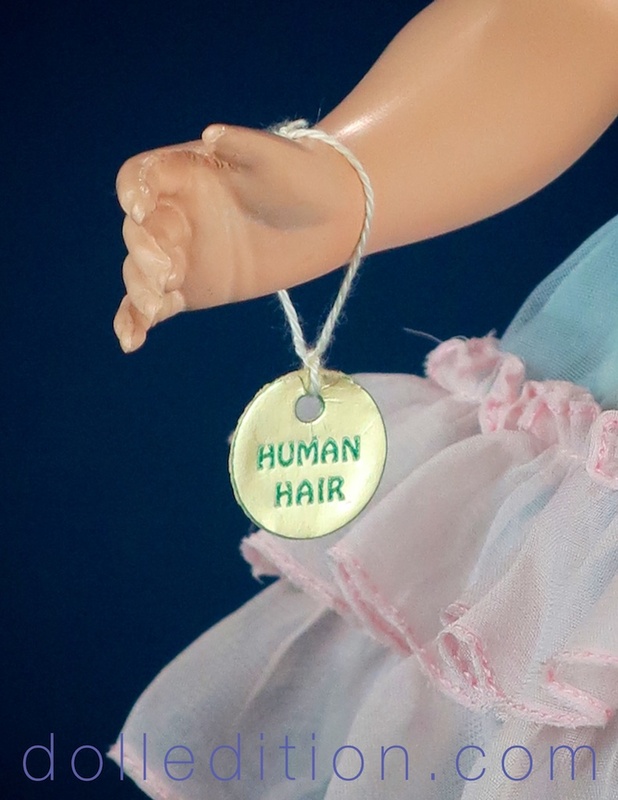 Besides her gold Alexander cloverleaf hangtag, this doll also has a hang tag announcing her "HUMAN HAIR" wig. 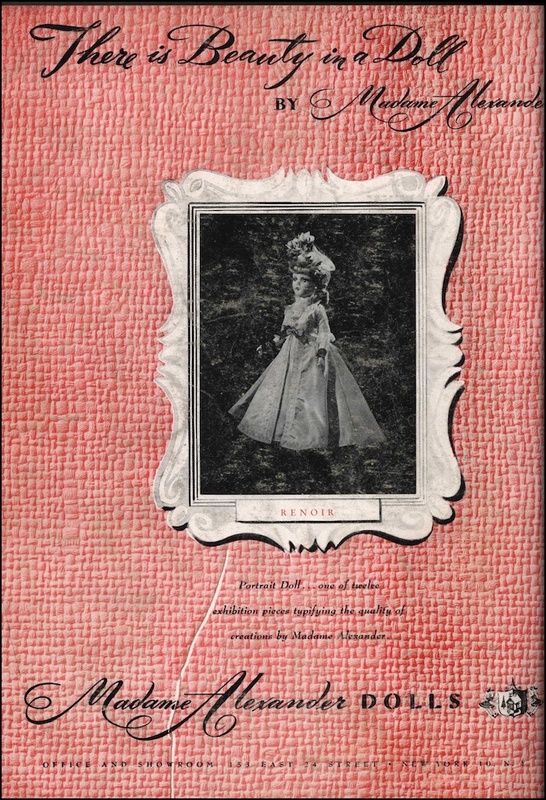 1946 Playthings ad for Madame Alexander Dolls featuring this composition Renoir Portrait using Wendy Ann.